All you need for ZoneScreen to work is network connection between your devices (your computers are both connected to the same network, or connected directly with cross-over cable or 1394 firewire cable, etc). 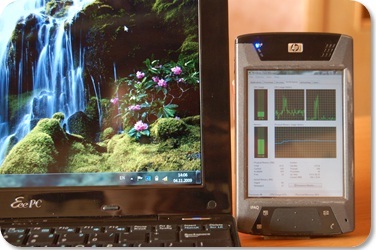 In case you are using Poket PC, you may use connection provided by ActiveSync (using cradle cable, IR port, etc). Extending functionality is supported for computers running Windows 2000, Windows Server 2003 and Windows XP (x86 and x64). Windows Server 2008, Windows Vista and Windows 7 support is limited. 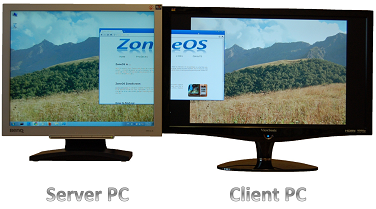 ZoneScreen consists of two parts: kernel-mode ZoneScreen Virtual Display Driver which is visible to Windows just as normal video card with monitor attached to it, and user-mode ZoneScreen Wizard which is responsible for capturing image (running at server side), transmitting it over the network, and drawing it at another computer (running at client side). Machine with extended desktop called server. Server machine have Virtual Display Driver installed and ZoneScreen Wizard running in server mode. Another machine acts only as external display and called client. Client machine have only ZoneScreen Wizard running in client mode. Both parts of ZoneScreen (driver and wizard) can run independently, though ZoneScreen Wizard performs better when using update API provided by ZoneScreen Virtual Display Driver. Otherwize it uses frame buffer polling which is CPU consuming and generally slow. This means that in case we are interested only in mirroring desktop image, we do not need to install Virtual Display Driver. And if we are extending desktop we could install ZoneScreen Virtual Display Driver and use any other image redirecting software on top of it. For example, modified TightVNC Server is capable of using ZoneScreen Driver update API. *Please keep in mind that Windows 7 support is strictly experimental. You are trying it for your own risk. Certain users have reported Blue Screens (BSODs). Windows Vista and Windows 7 have two important limitations affecting ZoneScreen Virtual Display Driver. First, when ZoneScreen Driver (which is XPDM) is running, Aero effect is disabled. You have to disable Aero manually (by enabling 'Basic' color scheme) before attaching ZoneScreen Display to ensure stable transition. The second problem is that Windows Vista x64 and Windows 7 have x64 digital signature enforcement for kernel drivers applied so ZoneScreen Virtual Display Driver that is not loaded unless this enforcement is disabled. You could boot Windows into Test Mode that will go away after reboot. People also have published instructions on how you could disable the enforcement permanently. ZoneScreen 1.1 Driver must be installed and 'Extend desktop onto this monitor' for ZoneScreen Display is checked. For security reasons Update API is available to local administraotrs only. In Windows Vista/7 server process of TightVNC must be executed under elevated administrator in order to be able to use Update API. If disabled Aero effect of Windows 7 is not an option, there is one workaround available for most modern computers: use built-in dual-head capabilities of a graphics adapter. If your video card have extra output but nothing is connected (for example, you cannot connect old laptop to that output because laptops missing video inputs) you still can extend your desktop onto this monitor, redirecting it's content with ZoneScreen wizard or using VNC. To do this, click "Detect" in "Screen resolution" settings applet, and even if you see "Another display not detected" you could force Windows to use it by clicking "Try to connect anyway" in "Multiple displays" drop-down menu. There is no ZoneScreen Wizard ports for Linux and Android, but it is possible to use cross-platform implementations of VNC as a replacement for ZoneScreen wizard. For example, server machine with Windows XP, ZoneScreen Virtual Display Driver and and VNC Server could use client machines with any operating system which supports VNC client. Because virtual display is completely identical to normal display, VNC Server could be transparently used above ZoneScreen display driver. Also you could run ZoneScreen Wizard (build for Windows 98) in Linux under Wine. If you have nice how-to guide about using Android device as ZoneScreen display feel free to email it to me so I can publish key points here. On Windows Server 2008 and Server 2008 R2 (if 'Desktop experience' feature is installed) and sometimes on Windows 7 Ultimate glass-transparence must be disabled manually before attaching ZoneScreen display by applying 'Windows 7 Basic' theme, in order to avoid transition problems. There is no chances to keep Aero anyway. As ZoneScreen Wizard lacks many features available in most VNC implementations, it is good idea to try VNC-like application instead of Wizard ontop of ZoneScreen Virtual Display Driver. For example, modified TightVNC Server is capable of using update API of ZoneScreen Driver. ZoneScreen Display is not visible in desktop properties applet in Windows 7. While I'm working on this issue you can use command line tool to manually adjust display position. ZoneScreen Wizard does not use encryption transmitting data between client and server. Therefore all information you send to client is potentially available to everybody in the network. Limited set of screen resolutions is hardcoded to virtual display driver, and up to 10 custom resolutions could be defined using ZoneScreen Wizard. Supported color depths are 8, 16, 24 and 32-bit. ZoneScreen Wizard supports command line scripting. Run 'zsserver.exe /?' to see available options. Windows XP Sp1 has a bug, which affects ZoneScreen Virtual Display Driver. Upgrade to Sp2 solves the issue. Note that this affects only server machine (client machine do not need ZoneScreen Driver to be installed). You could add more than one virtual display, though this feature is not incorporated into installer. Run 'zsserver.exe /installdisplay' from ZoneScreen program folder. If you need ZoneScreen in a different configuration (operating system, CPU architecture or language), or you have suggestion for a new feature to be implemented, it is very unlikely for new versions to appear in the nearest future. I have had plans for ZoneScreen 2.0 with WDDM dummy driver supporting Windows 7, but I do not have much time for it. I haven't done any changes to ZoneScreen in years. Copyright © 2006-2011 Vasily Tarasov.